Shane presents Denise & Stuart with a cheque for £4083.11 outside Waltham Abbey’s Marriot Hotel. 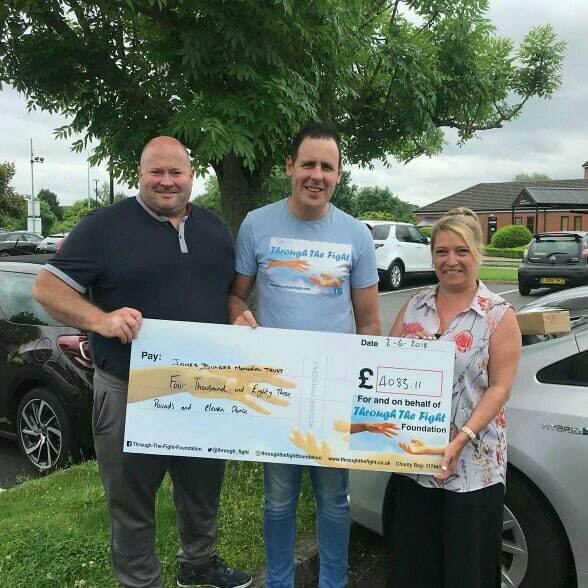 Waltham Abbey Charity Through The Fight Foundation recently held a fundraising Night in memory of toddler James bulger who was kidnapped and murdered whilst out shopping with his mother Denise in Liverpool. After learning about the charity Denise had set up in memory of James, Shane instantly decided he wanted to help. Shane along with his Through The Fight team (Maria Markham) and (David Sparrey) travelled to liverpool in March to meet with Denise and celebrate what would have been James’s 28th Birthday. The Through The Fight team then organised a local fundraising Night which was held at Waltham Abbey’s Town Mead Sports & Social Club on friday 1st June. James Mum Denise and her Husband Stuart travelled down from Liverpool to attend the Event which featured Performances From BBC The Voice Finalist Lydia Lucy and X Factors Scarlett Lea along with Waltham Abbey’s very own Dance group Streetz Ahead. The night raised a further £1740.31 to add to the money raised from Shane’s Great wall of China climb, which totalled a massive £4083.11 raised for The James Bulger Memorial Trust. The James Bulger Memorial Trust has since brought a lodge which will provide restbite for Children who have suffered abuse or bereavement. Shane and the Through The Fight team would like to say a massive thank you to each and every person who sponored the climb and Attended the Fundraiser on 1st June along with performers and The Management and Bar Staff at the town mead who were fantastic throughout. Waltham Abbey as a community really done us proud.